It was before windows, before graphics, even before Zork (pictured in thumbnail). 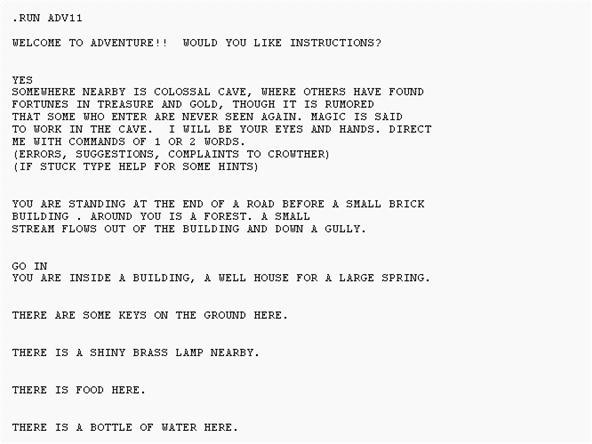 In 1975-76, while working as a programmer at defense contractor and packet switching inventors Bolt, Beranek, and Newman (now BBN, part of Raytheon), spelunking enthusiast Will Crouther wrote a program called Colossal Cave Adventure (below). In 700 lines of FORTRAN code, he created not just adventure games as a genre, which take their name from his game, but PC games in general. It consisted entirely of text and played a bit like a Choose Your Own Adventure book, where players would be given prompts and asked to type in the actions they would like to preform based on the conditions described in the text. Despite all the graphical progress made in the 35 years since, these types of games still exist. Today text-based adventures like these are known as interactive fiction, and are still celebrated by a large gamer subculture. Every year since 1995, British programmer Graham Nelson has run the biggest event for this lively scene: the Annual Interactive Fiction Competition. 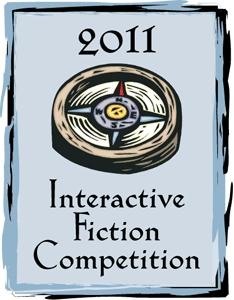 It features simple rules, is open to anyone with a desire to craft an interactive fiction game, and offers a number of donated prizes for winners. The results are determined by a panel of judges and the votes of the general public, who are allowed to play and vote on most of the entrant games for free here. That means it also provides the best way for those with only a passing interest in the format to see the best it has to offer. Playing interactive fiction can be a little confusing at first, so I suggest checking out this postcard-sized explanation of the genre's conventions before getting started if you aren't familiar with how it works. These games are a great portal for non-gaming readers into the world of interactive media and are an important part of gaming history, making them worthwhile for nearly anyone to check out.